CSA 5, 10¢ rose tied neat blue COLUMBIA / S.C. // NOV 11 cds on cover to Roswell, Ga. Stamp has tiny piece of lower left corner missing and upper right corner with tears and abrasions. Cover reduced at top and at left with sealed tears at right, but overall nice appearance. 2000 CSA Certificate #3940 2007 SCV $800. CSA 5, 10¢ rose, 4 large to huge margins all around, tied RICHMOND / Va. cds on pristine homemade cover to "Col. C.W. 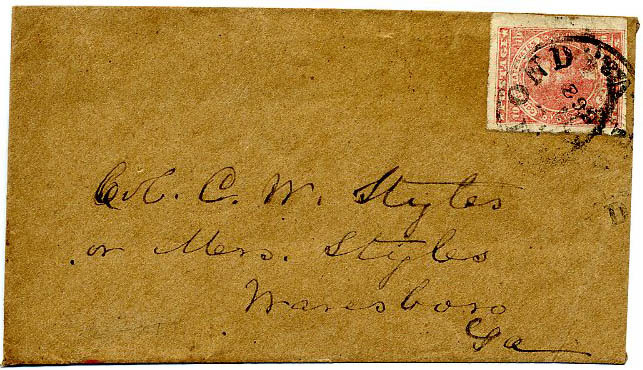 Styles, or Mrs. Styles, Waresboro, Ga. Carey W(entworth) Styles (1825-1897) was the commander of the 13th Regiment Ga. Volunteers, enlisted as a captain but promoted to Col. On August 17, 1861. He retired on May 10, 1862. He was most well known as the founder and first editor of The Atlanta Constitution, one of the greatest papers in the South for molding public opinion, founded in 1868 after the War, as well as a Georgia senator. Stiles was a bitter hater of everything that he considered unfriendly to the South. His papers are housed at Emory University in Atlanta. Detailed bio accompanies. CSA 5, 10¢ rose with close to huge margins, tied by neat blue PETERSBURG Va. // JUL 17 cds on clean 1862 folded business letter to Republican Grove Va. saying that “the demand for government use has been so heavy that our factories (which have been furnishing us with a few goods at moderate prices) have been unable to let us have any bals (?) for a month or more – consequently we are unable to do any thing for our friends…thankful to add the Yankees are not here yet”, Very Fine, Ex Tobias $750. 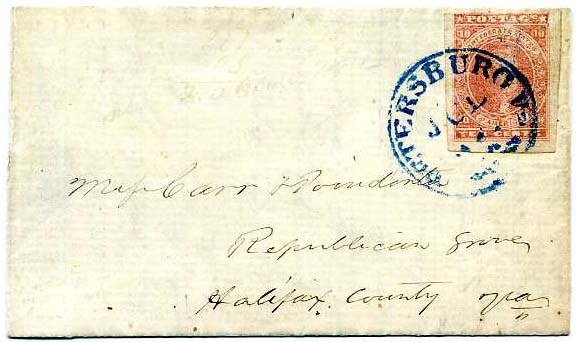 CSA 5, 10¢ rose, pale pink shade with close margins, tied beautifully struck bold RICHMOND / VA. // APR / 30 / 1863 cds on partial folded letter to “John C(oles). 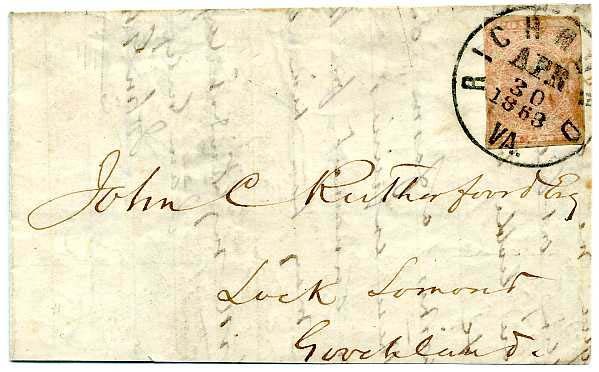 Rutherford, Esq., Lock Lomand, Goochland (Co., Va)” from “John G. Williams 20 April 1863”. [$600. CSA 5, 10¢ rose with four even margins all around used with manuscript cancel of “Dixie (Virginia)” to “Surgeon S(pottswood). W(ellford). 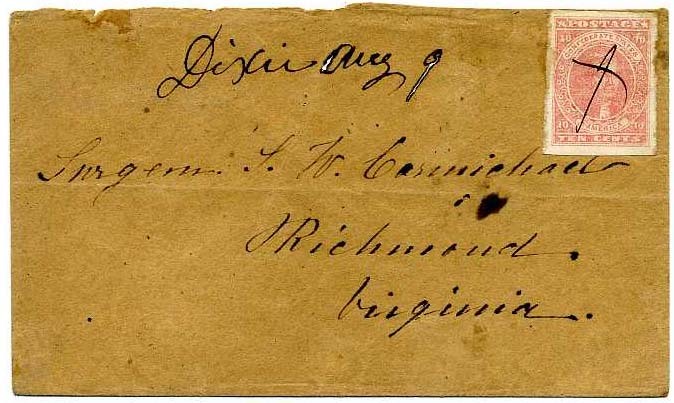 Carmichael, Richmond, Virginia”; 2000 CSA certificate as genuine with “top back flap missing and with small ink erosion spots in postmark”; Carmichael was a surgeon in the Confederate States Infantry – detailed bio enclosed. He was born and died in Fredericksburg (1830-1904) and during the war served in various hospitals in Culpeper C.H., Danville, Chaffin’s Bluff, Richmond and Lynchburg. Wonderful town and address. $900. 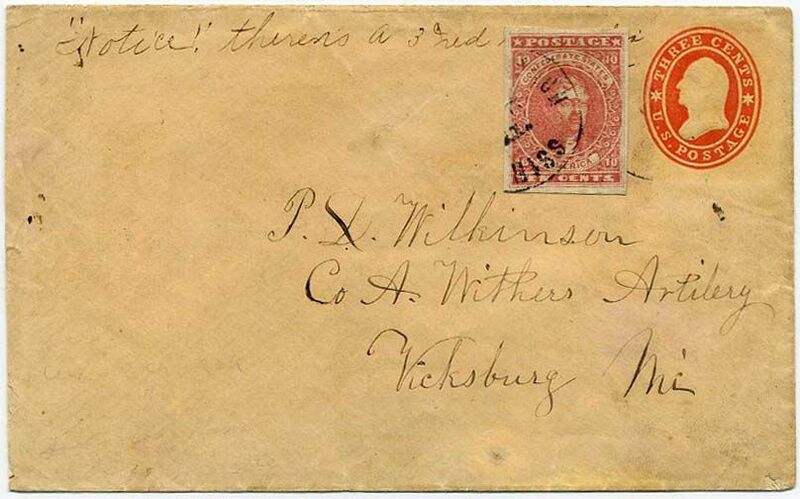 CSA 5, 10¢ rose tied neat bold RICHMOND / Va. // JUL / 3 / 1862 cds on small commercial ladies cover to “Mrs. G. W. Taylor, Montgomery, Alabama” with note on inside back flap (tiny part missing, but not into the note): “It is almost useless for you to write to me here for I would scarcely have time to get the letter but if any of you be sick ---- me dispatch to --- and they will forward it from there”; Ex Boshwit, a Charmer! 2008 SCV $800. $750. 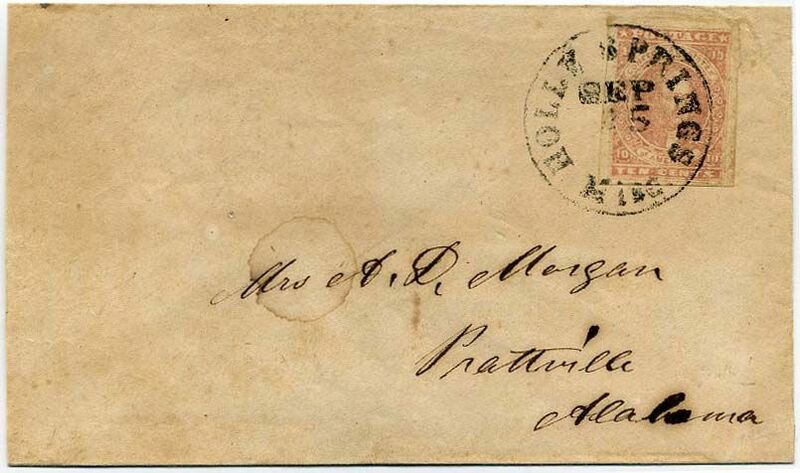 CSA 5, 10¢ rose (diagonal pre-use crease) tied neat RICHMOND / Va. // JUL / 16 / 1862 cds on cover to “Mr. William R. Johnson, Petersburg, Va”, flap tears otherwise Very Fine, 2009 SCV $800. 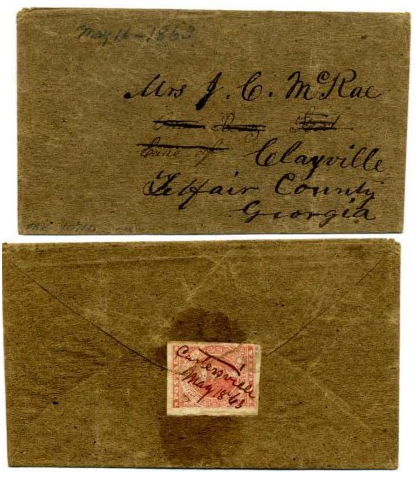 CSA 5, 10¢ rose (soiled and small crease) tied GRIFFIN / GA. // Aug / 14 cds (4 margins) on cover to “John W. Park, Atty At Law, Greenville, Georgia”, cover raggedly opened at lower right, long original letter on legal paper from J. D. Stewart regarding a legal case, Ex Crouch. $400. Letter folded up at bottom for scan - too long for scanner bed. 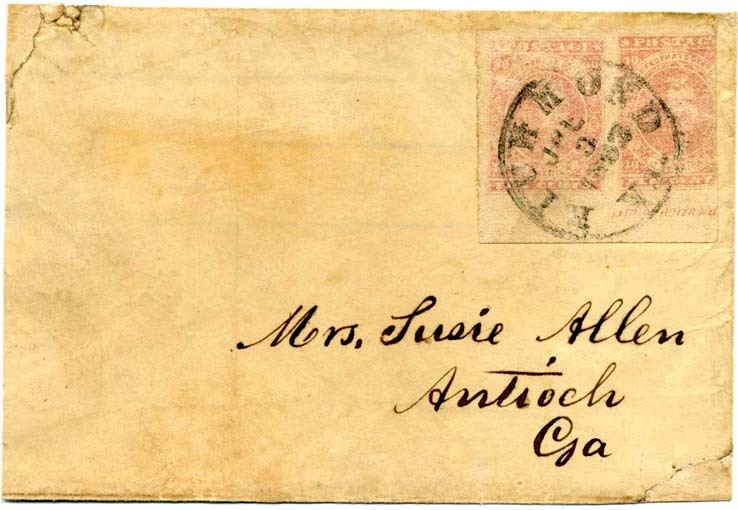 CSA 5, 10¢ rose (4 margin) manuscript canceled on clean cover to Mrs. Susie Allen, Antioch, Troup Co, Ga., reduced at left $250. CSA 5, 10¢ pale rose-pink, comet variety, (4 large to huge margins) used with manuscript cancel of “Concord Miss Sept 4“ on blue folded letter to Lieut R. M. Moorhead, Vicksburg, Miss, Co K. 2nd Reg Miss S[tate] T[roops] from his wife, Mary, telling him of family health problems, planting the fields without him, etc. ; some file splits and bit of staining. 2011 SCV $800. $400. 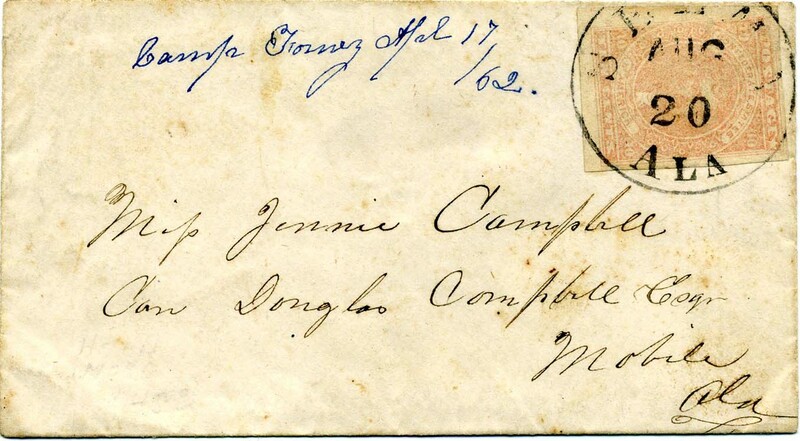 CSA 5, 10¢ rose used with manuscript cancel of Cartersville [Ga] May 18 ’63, stamp torn in half upon opening, addressed to Mrs. J. C. McRae, Clayville, Georgia (part of an original address in different hand / ink crossed out in favor of new address) $220. 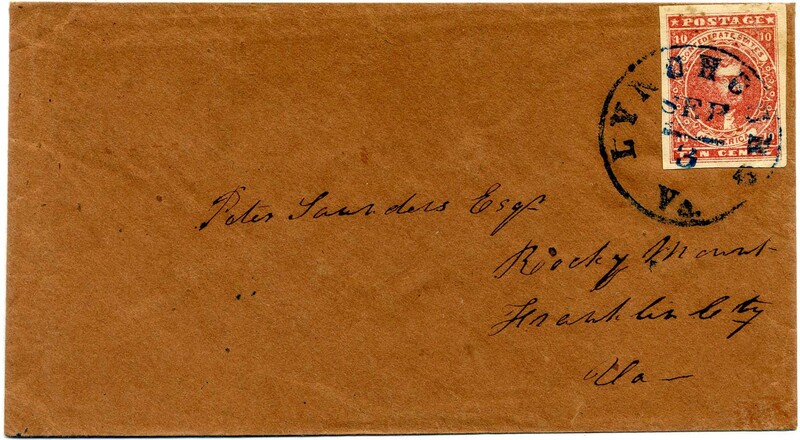 CSA 5, 10¢ rose (small faults) tied partial cds of [WYTH]EVIL[LE / VA] (cds on homemade cover to Messrs Green & Co at Iron Mines, Cripple Creek [Foundry], Austinville, Virginia with original letter headed “Saltville Va Aug 26. 1862” from B. H. Bigham, President Planters Manufacturing Co. of Georgia saying he went to Wytheville yesterday to see their shipment, etc. Cripple Creek Foundry played a significant roll in the Southern military effort with several foundries in Wythe County from which Tredegar Ironworks drew pig or bar iron. Flap tear. $300. 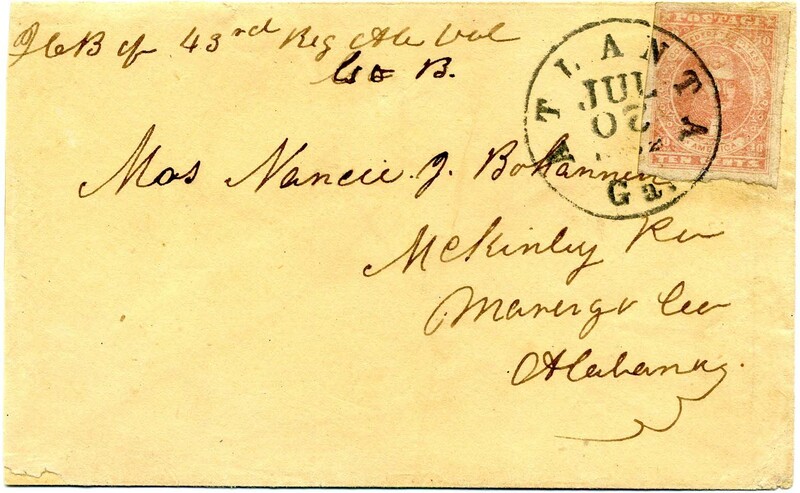 CSA 5, 10¢ rose tied bold neat MONTGOMERY / Ala. // JUL / 22  cds on cover to Mr. Jno H. Newton, Athens, Ga. with contents docketing that letter was from Gilmer & Co., Com[mission] Merchants. Stamp with some small faults otherwise fresh and Very Fine. J. H. Newton is shown in Co. H, 53rd GA Regiment. $600. 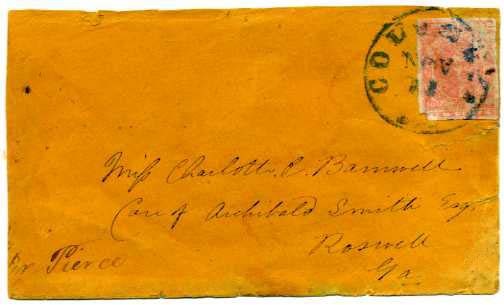 CSA 5, 10¢ rose tied manuscript Longmires Store SC 12 July on mottled cover address to Cadet O. Sheppard Charleston, So. C., top back flap missing, bit reduced at right, Gorgeous 4-margin stamp. Cadet 2nd Lt. Orlando Sheppard (1844-1929) was an attorney in Edgefield at the Citadel, Company B. He served in the Battalion of State Cadets, South Carolina Local Defense Troops at Charleston. Ex Kohn. $500. 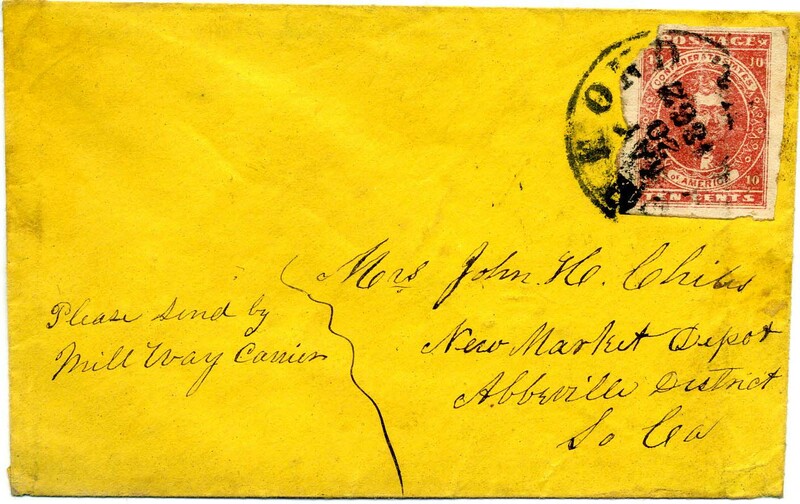 CSA 5, 10¢ rose tied neat GUINEYS / Va. cds with second strike at left on cover to Prudence King, Liberty Hill, N. C.; slightly reduced at right, 2007 CSA Certificate 04959. $600. CSA 5, 10¢ rose (small faults) tied by RICHMOND / Va. // JUL / 11 / 1862 cds on legal-size cover to P. H. Mangum, Forestville, N.C., Confederate States of America, War Department, Official Business imprint, CSA Catalog type WD-07, folded in at left but could be shown either way, professionally repaired at top including addition of paper and part of imprint, Scarce use with 10¢ rose! $650. CSA 5, 10¢ dull rose (4 large even margins) tied beautifully struck HOLLY SPRINGS / Miss. // SEP / 15 cds on cover to Mrs. A. D. Morgan, Prattville, Alabama; 1991 CSA Certificate, Ex Agre, slightly reduced at left and light water spot at center otherwise Very Fine. Lovely cover. $800. CSA 5, 10¢ rose (4 margins, small faults) tied scarce lightly struck red SOCIAL CIRCLE / Geo. 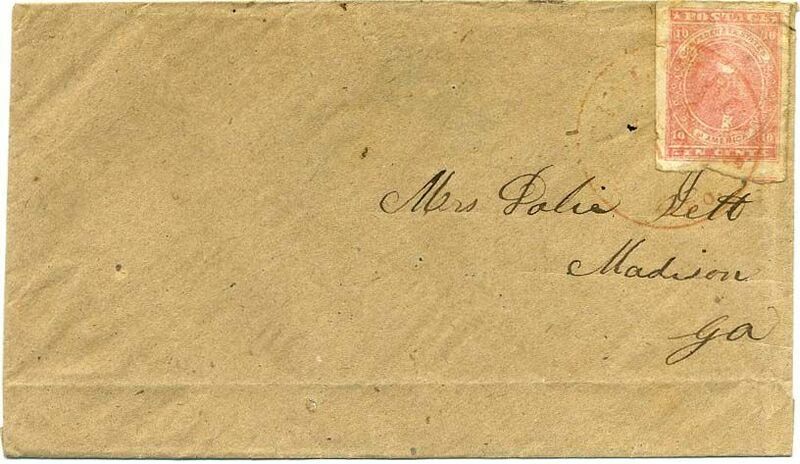 postmark on homemade cover to Mrs. Dolie Jett, Madison, Ga., SCV $925. $500. 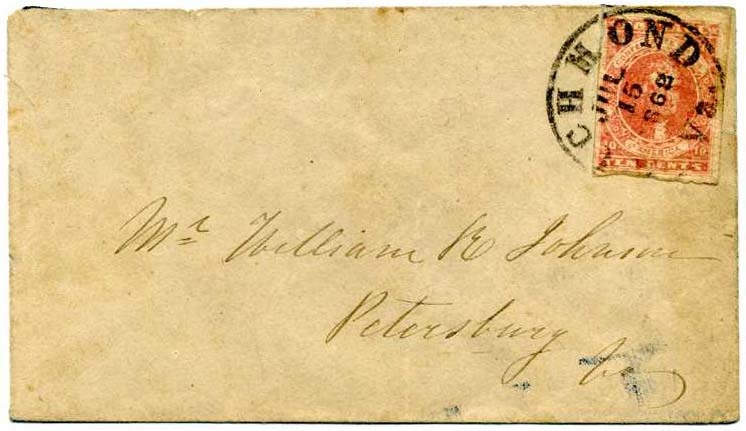 CSA 5, 10c rose (4 perfect margins) tied UNION CHURCH Miss cds used over 3¢ star-die entire #U27 addressed to P. D. Wilkinson, Co. A, Withers Artilery (sic) Vicksburg Mi with note at top “Notice! 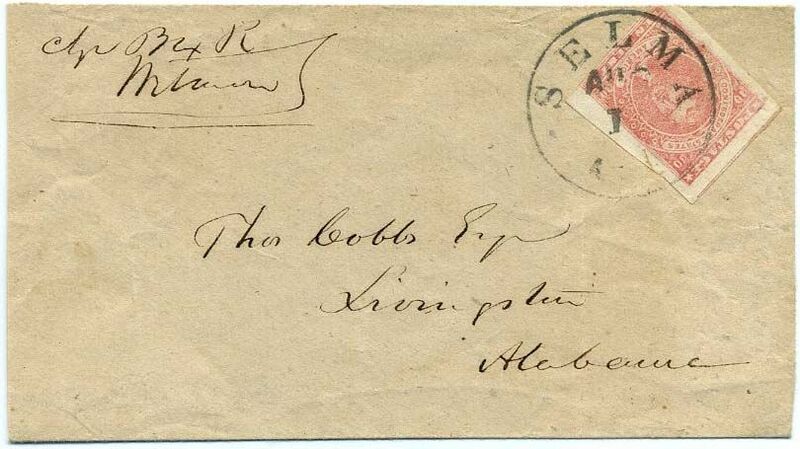 There is a 3¢ red under this one” which appears to be in the same hand and ink; slightly reduced at left, stamp moved to the side to show the star-die. Philip Doddridge Wilkinson enlisted as a private in Co. A, Mississippi 1st Light Artillery. He died at the Battle of Vicksburg. Ex Finney and Skinner. $800. 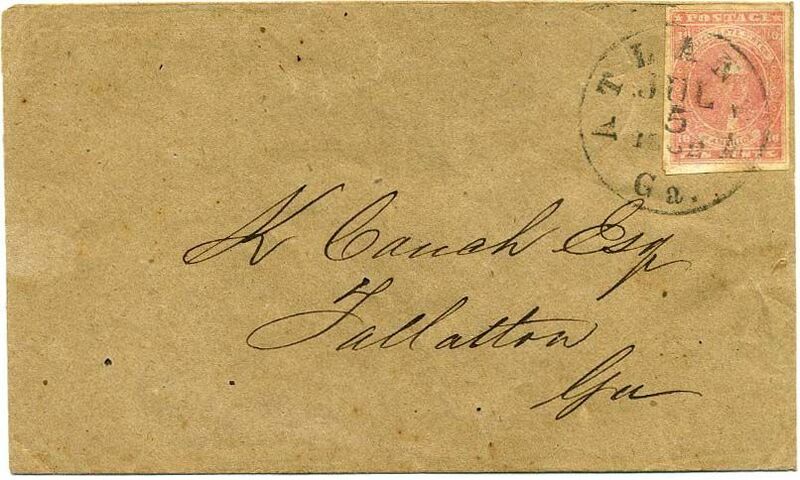 CSA 5, 10¢ rose (4 margins, faint small corner creases) tied neatly struck ATLANTA / Ga. // JUL / 5 / 1862 cds on clean homemade cover to K Couch Esq, Talbotton, Ga.; slightly reduced at right. SCV $800. $600. CSA 5, 10¢ rose (3 huge margins with tiny tear at lower left and top corner folded over top edge of cover) tied by neat SELMA / ALA // AUG / 1 cds on clean homemade cover to Thos Cobb Esq, Livingston, Alabama; slightly reduced at left. Nice use. SCV $800. $550. 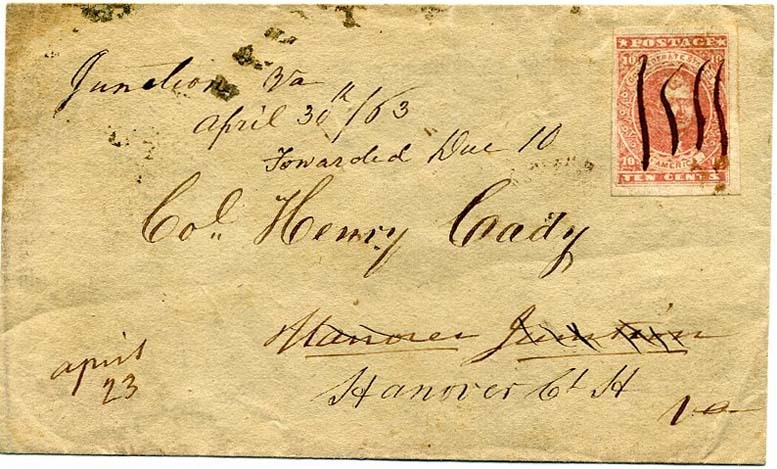 CSA 5, 10¢ rose (4 margins) used with pen strokes and manuscript “Junction Va, April 30th / 63” on homemade cover to Col. Henry Cady, Hanover Junction, Va. which has been crossed out and cover redirected to Hanover Ct. H[ouse] with manuscript “Forwarded Due 10”. Nice forwarded use. Henry Cady was a prosperous contractor. $850. 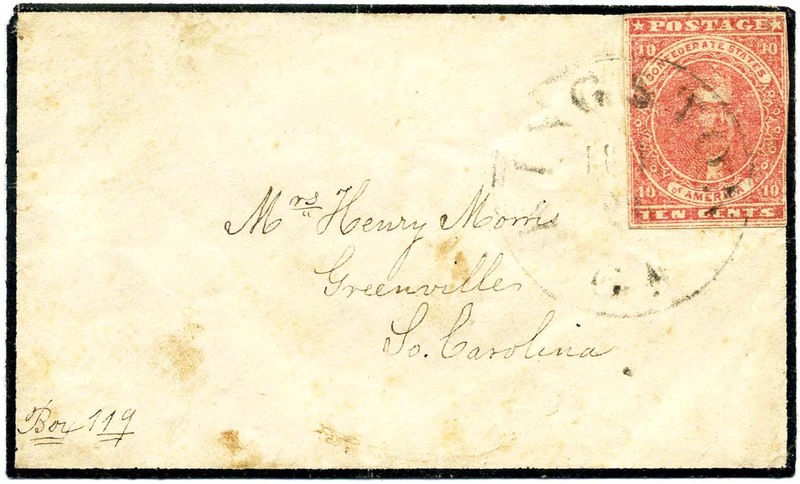 CSA 5, 10¢ rose variety with G & E of POSTAGE joined, position 10, CSA Catalog 5-v2, used with manuscript Fairburn, Ga July 22 postmark on homemade cover to S. D. Kirk, Charleston, So. Ca. ; Scarce small town and nice variety. $650. 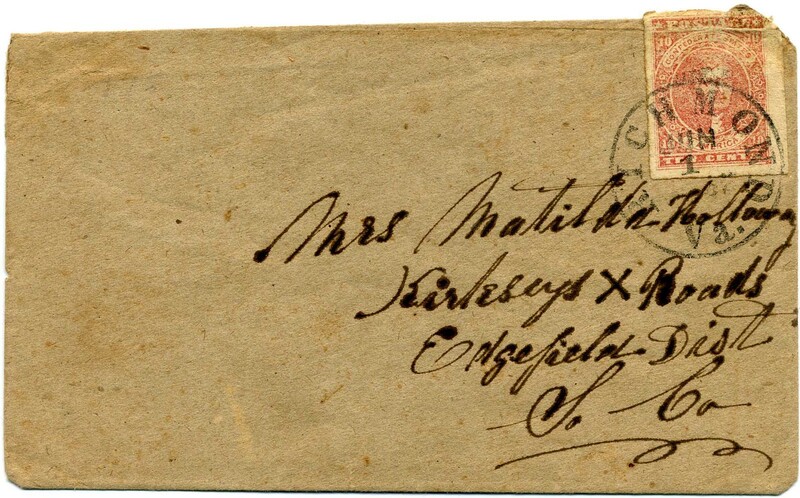 CSA 5, 10¢ Rose with large margins to touched at bottom, small colored in thin spot, tied by RICHMOND / VA. cds on narrow cover to Greenville Ala., 1 May 1862 magenta pen docketing at left, addressed to Mrs. W. T. Walthall, Care of Jas. N. Monroe Esq, Greenville, Alabama. $375. Major William T. Walthall (1820-1899) organized the Mobile Southern Foresters into Co I of the 12th Alabama Infantry. Much more information on the linked page. 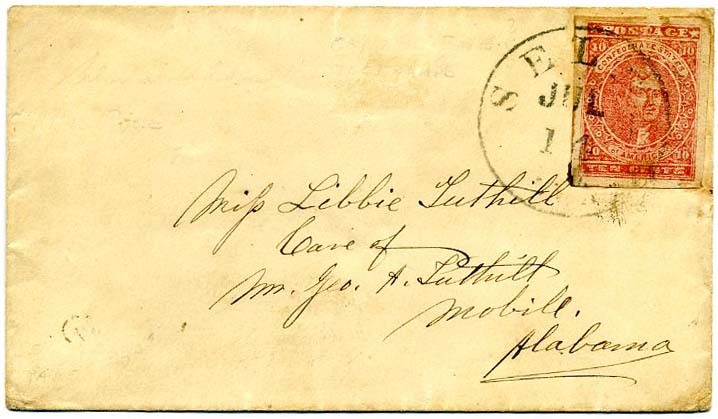 CSA 5, 10¢ rose tied SELMA / Ala. // JUL / 14 cds on cover to Miss Libbie Tuthill Care Geo. 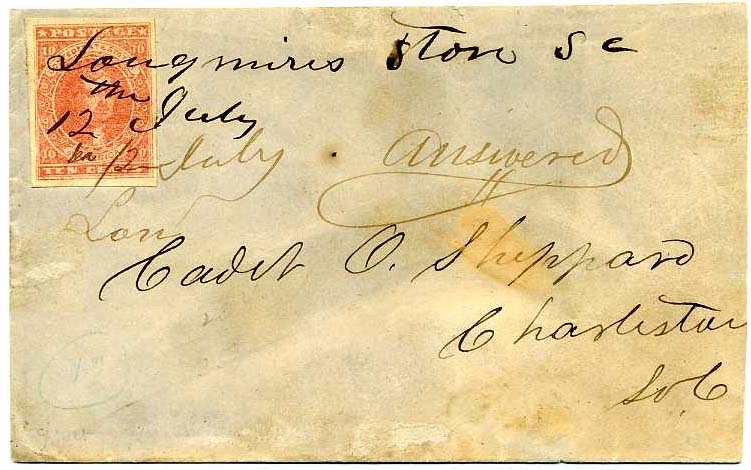 A. Tuthill, Mobile, Alabama, 4 huge margins all around on stamp with tiniest stamp faults. $650. 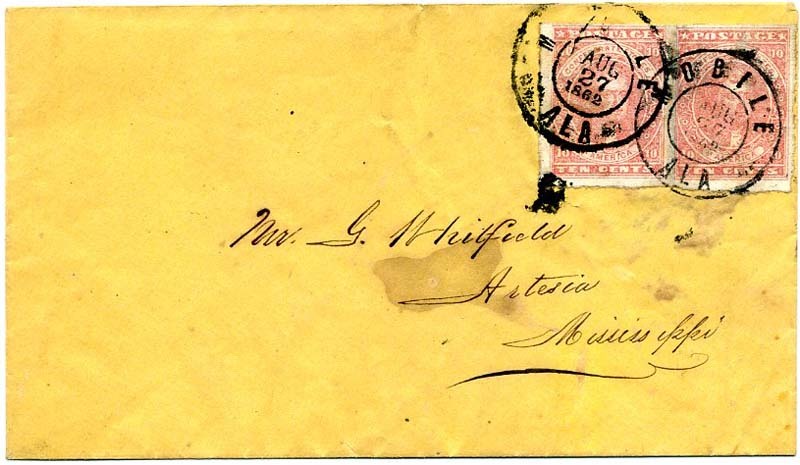 CSA 5, 10¢ rose horizontal pair, positions 33 & 34, tied double strike of MOBILE / ALA // AUG / 27 / 1862 dcds on cover to G. Whitfield, Artesia, Mississippi, small stain in address extending to underneath pair, left stamp small tear at lower left masked by cancel, missing part of back flap, SCARCE DOUBLE-RATE. Scott does not catalog pair on cover. Off cover pair catalogs $2,250, CSA CV $2,750. $1,500. 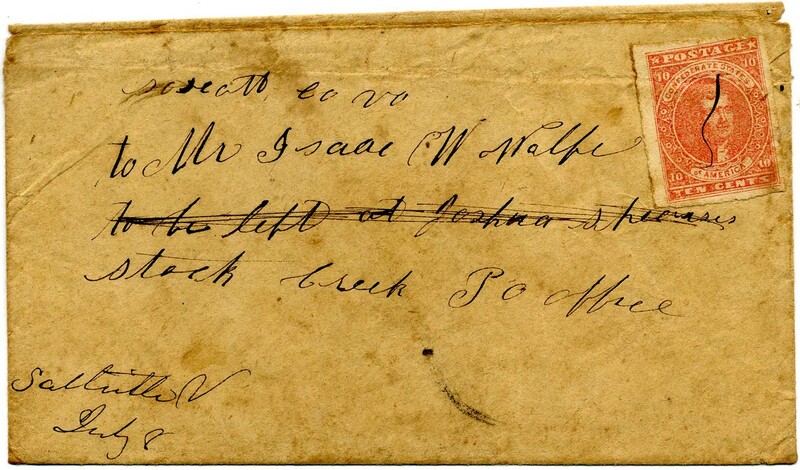 CSA 5, 10¢ bright rose (large margins to just in at UR) used with manuscript cancel of “Saltville, V[a] July 8” on homemade cover “to Mr. Isaac W. Wolfe, Stock Creek P.O. Office” with “Scott Co Va” at top and “to be left at Joshua Pearses” which has then been crossed out. 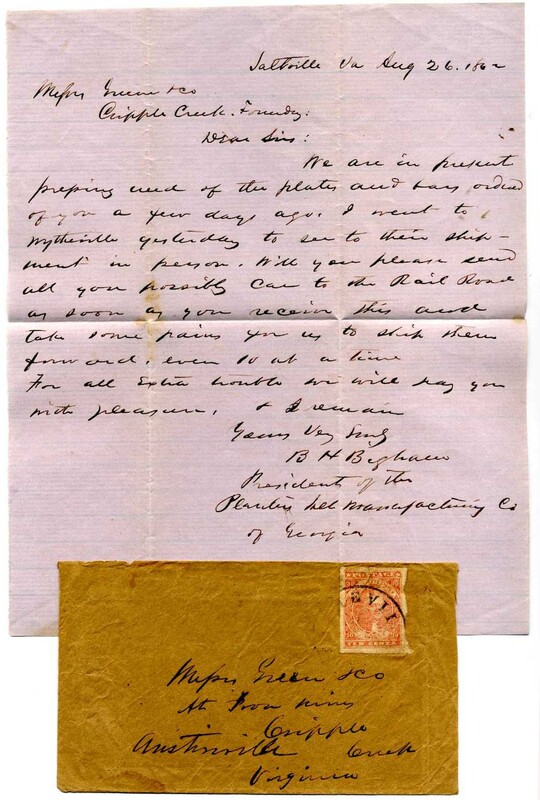 Photocopy of original letter (but not letter itself) accompanies. Light file fold across cover which affects the stamp, still nice use. $350. 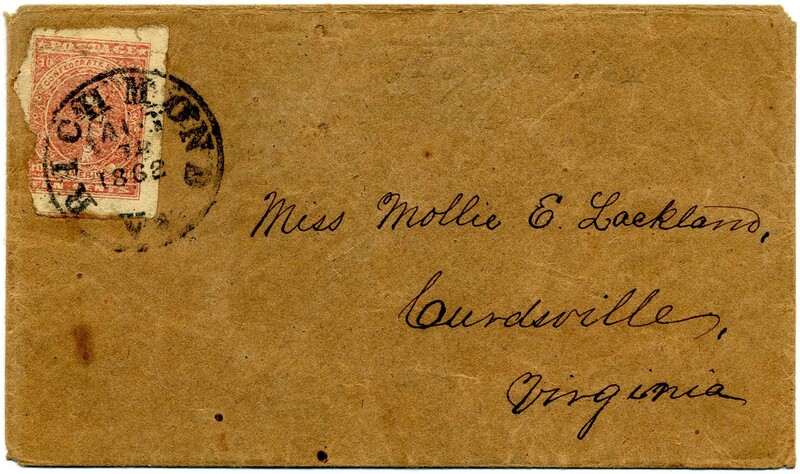 CSA 5, 10¢ rose (pre-use crease and into design at lower left but unusual nice shade) tied on clean homemade cover (couple tiny holes on face) to Miss Mollie E. Lackland, Curdsville, Virginia. Ex Cox. SCV $800. $275. CSA 5, 10¢ rose, malformed “T” of TEN appears as “F’ – position 4 (4 margins, gum stains) tied part strike of YAZOO CITY / Miss. 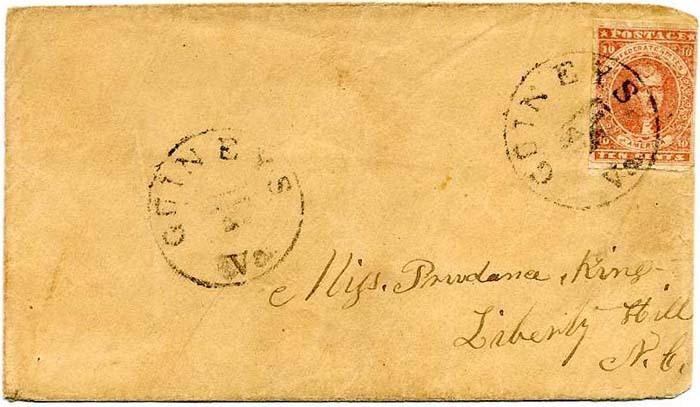 // OCT / 11 with second full strike at opposite corner, on narrow commercially made cover to Mrs. C. W. Stevens, Spartanburg, South Carolina, sealed flap tear. $350. 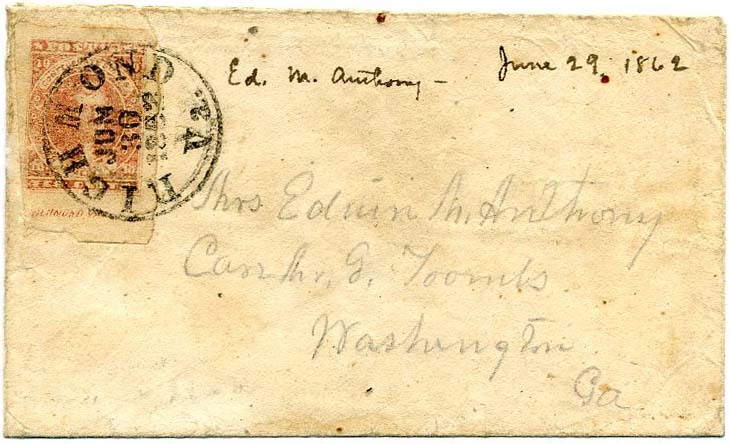 CSA 5, 10¢ rose (faulty/overhanging cover edge) tied neat RICHMOND / VA. // JUN / 1 / 1862 cds on homemade cover to Matilda Holloway, Kirkseys X Roads, Edgefield Dist, So Ca, 1978 APS certificate, Ex Bill Welch. $300. CSA 5a, 10¢ carmine, rich true carmine color, tied ORANGE C.H. 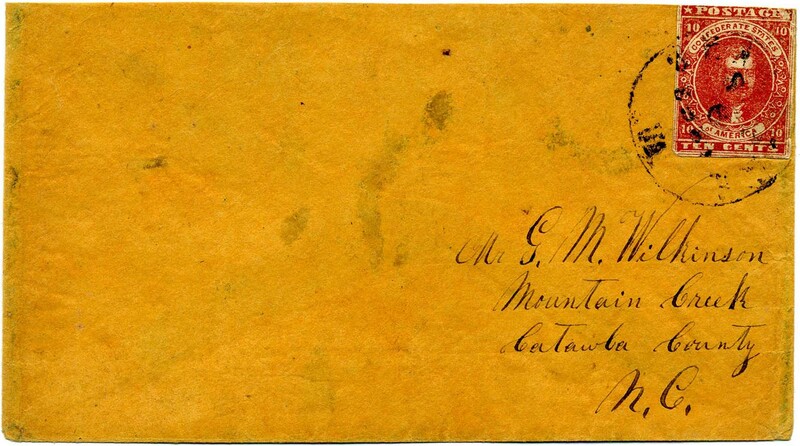 / VA. // SEP / 6 / 1863 CDS on cover to G. M. Wilkinson, Mountain Creek, Catawba County, N.C., small stamp fault at upper right and light cover stains, slightly reduced at top, 1997 PF certificate, SCV $5,000. RARE SHADE! $800. 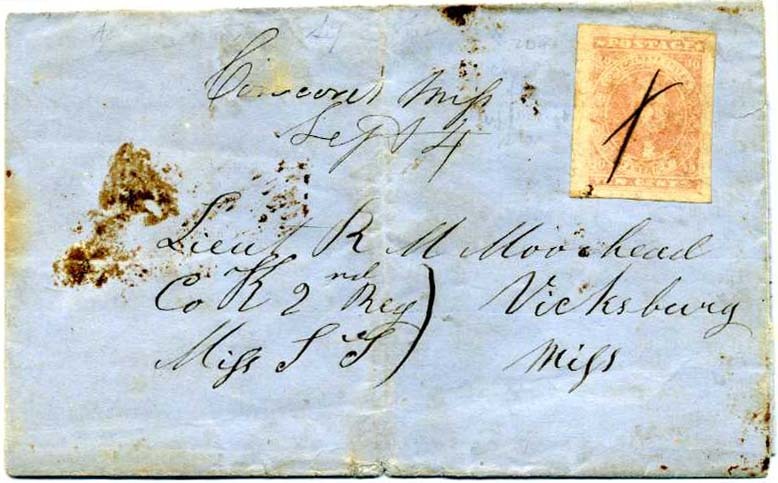 CSA 5, 10c rose (roughly separated and pre-use crease) tied RICHMOND / Va. // MAY / 20 / 1862 cds on cover to “Mrs. John H. Chiles, New Market Depot, Abbeville District, So. Ca.” with notation “P.M. Please send by Mill Way Carrier.” $450. The “Millway Carrier” notation has always been somewhat of a mystery. 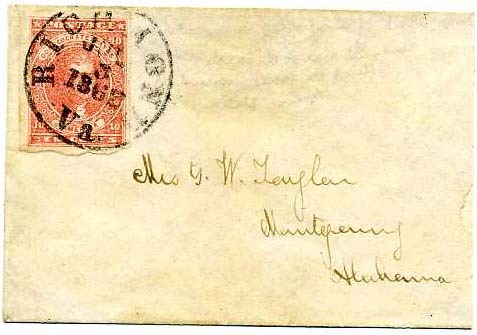 Even though the cover originates in Virginia, the mark is associated with the Millway SC post office. Much more information on the linked page. 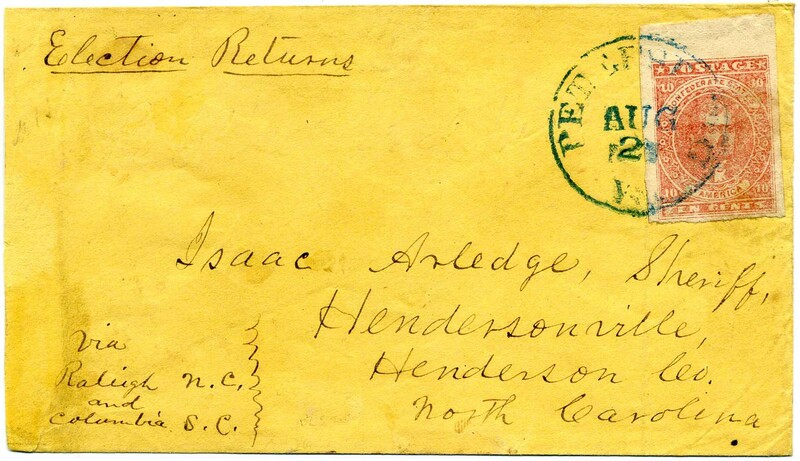 CSA 5, 10¢ rose, tied neat blue PETERSBURG / Va. // AUG / 21 cds on cover to Isaac Arledge, Sheriff, Hendersonville, Henderson Co., North Carolina / Via Raleigh N.C. and Columbia S.C. with docketing at upper left “Election Returns.” $450. Isaac Arledge biographical information on the linked page. 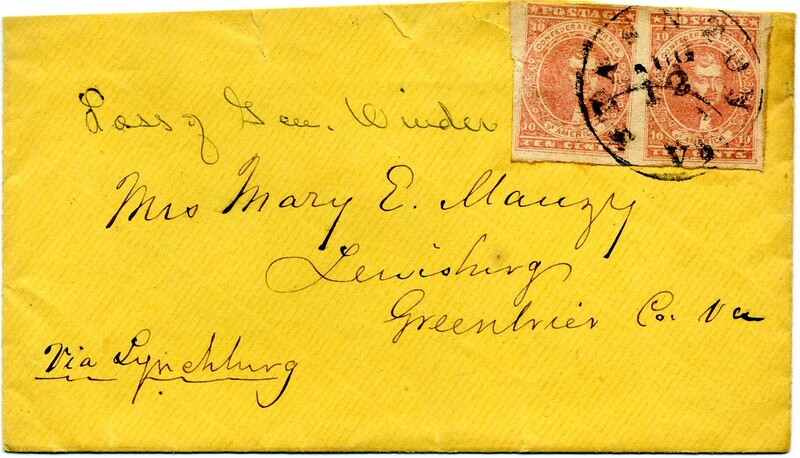 CSA 5, 10¢ rose pair with imprint on right stamp LITHO OF HOYER & LU(DWIG) canceled neat RICHMOND / Va. // JUL / 3 / 1862 on cover to “Mrs. 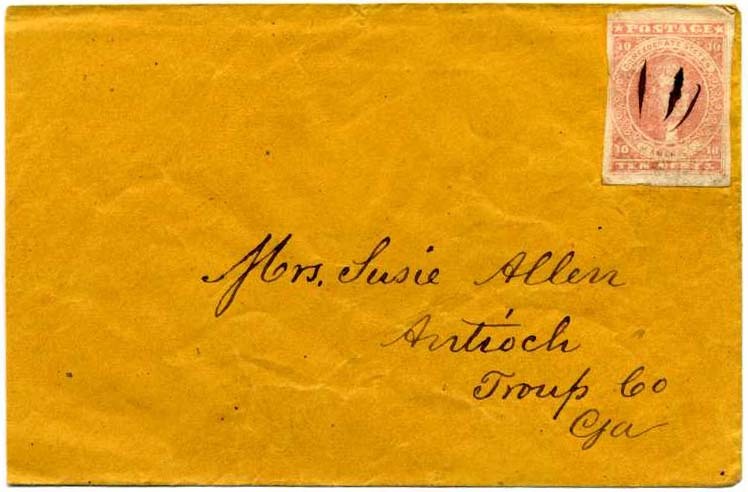 Susie Allen, Antioch, Ga.; reduced at left with sealed tears at UL and LR corners; a RARE IMPRINT, signed WGB (Wm. G. Bogg) 2018 SCV for off-cover pair with no imprint is $1,500. Quite scarce on cover! $1,250. CSA 5a, 10¢ carmine (4 large to huge margins, small light crease at bottom right corner and small rubbed spot at top right), tied perfectly strike blue LYNCHBURG / Va. // SEP / 3 cds on fresh cover to Peter Saunders, Esqr, Rocky Mount, Franklin Cty (County), Va. CLASSIC EXAMPLE OF THE RARE CARMINE SHADE ON COVER. Ex Caspary and Kilbourne. SCV $5,000. $3,750. CSA 5a (CSA Catalog #), 10¢ dull rose (4 clear to large margins), tied bold clear ATLANTA / Ga. // JUL / 20 (inverted) / 1862 on cover to Nancie J. Bohannon, McKinley PO, Marengo Co[unty] Ala. Soldier’s endorsement at top, “JCB of 43rd Reg Ala Vol.” Slightly reduced at left. Ex Risdon, Judd and Kilbourne. SCV $750. $700. James C. Bohannon served in Company B, 43rd Alabama Infantry. Much more information on the linked page. 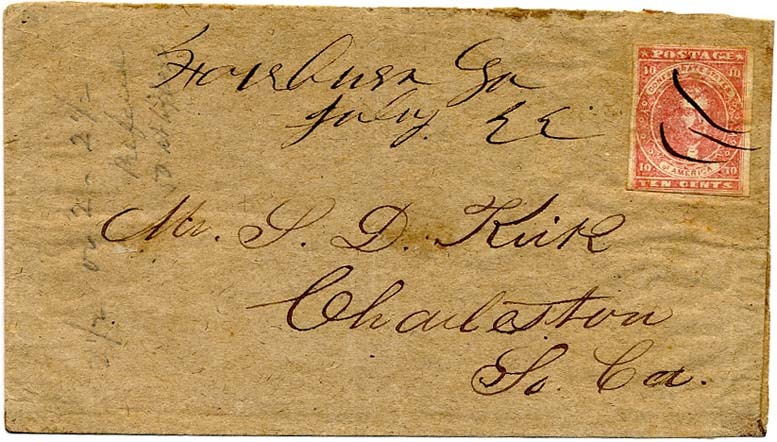 CSA 5, 10¢ rose (4 clear to huge margins), tied nicely struck blue LYNCHBURG / Va. // AUG / 3 / 1861 cds on folded bank folded letter form, partly printed and dated Aug. 2, 1862. 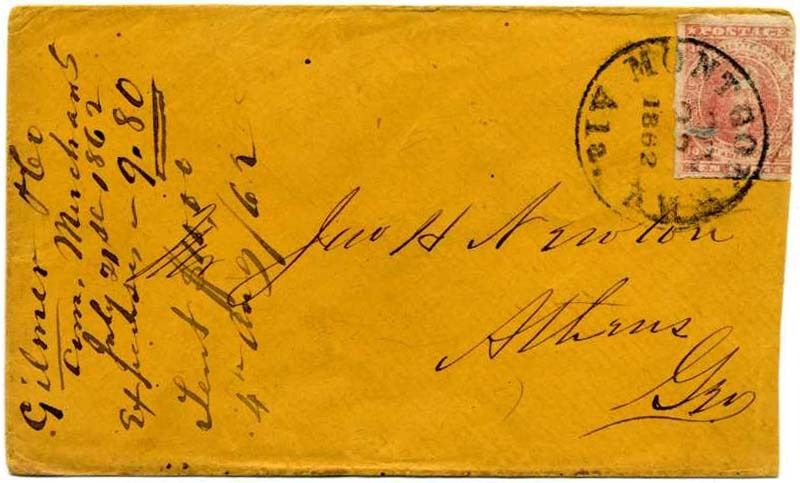 Earliest recorded cancel March 10, 1862, thus this date struck in error and so noted in Stanley B. Ashbrook pencil “unconditional guarantee” on verso where it is noted as “Ex Richey.” Addressed to Geo. 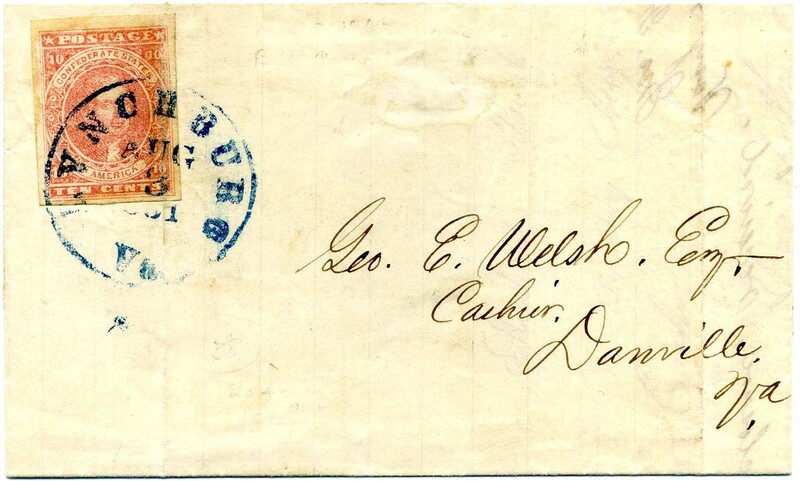 E. Welsh, Esq., Cashier, Danville, Va., from Jno. F. Baugh, Cashr., Merchant’s Bank of Virginia. Two vertical file folds, one through stamp which is also slightly gum stained but Very Fine appearance. SCV $750. $375. CSA 5-v1 (CSA Catalog), 10¢ rose, Malformed "T" of "TEN" - "ZEN" variety, positions 4-5 from the transfer stone, horizontal pair, left stamp the "ZEN" variety listed in both Scott and CSA Catalog, large margins to just touched at top left, bright shade, tied by STAUNTON / Va. // AUG / 12 cds on cover to Mrs. Mary E. Mauzy, Lewisburg, Greenbrier Co[unty, WEST] Va., endorsed "Via Lynchburg;" recipient's note "Pass[ing] of Gen. Winder" refers to the death of Brig. 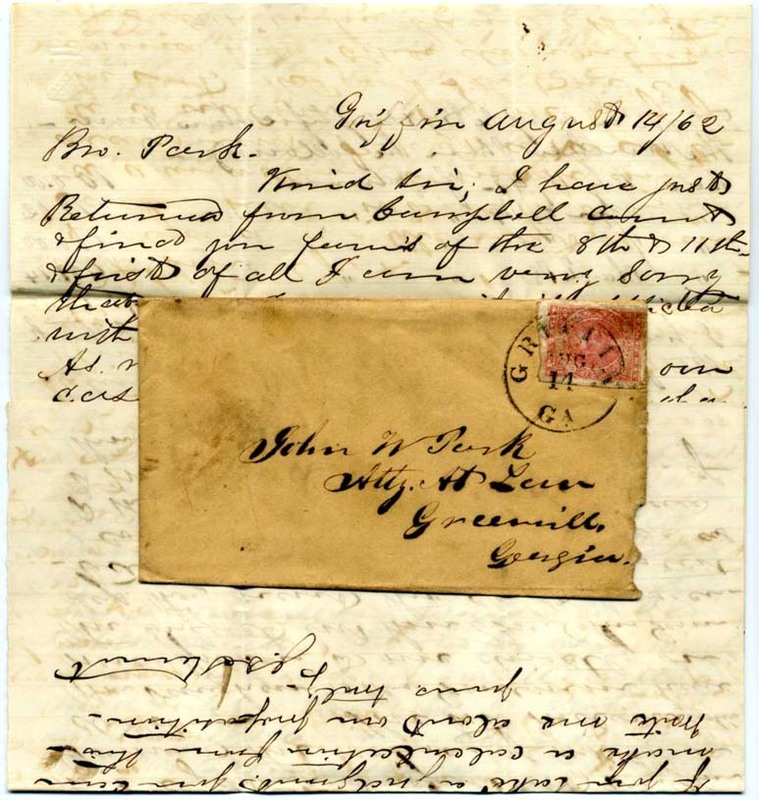 Gen. Charles Sydney Winder, commander in 1862 of the "Stonewall Brigade," who was killed three days prior to the sending of this letter at Cedar Mountain. Pair with tiny tear at left, cover slightly reduced at top and small edge tears, otherwise Fine. 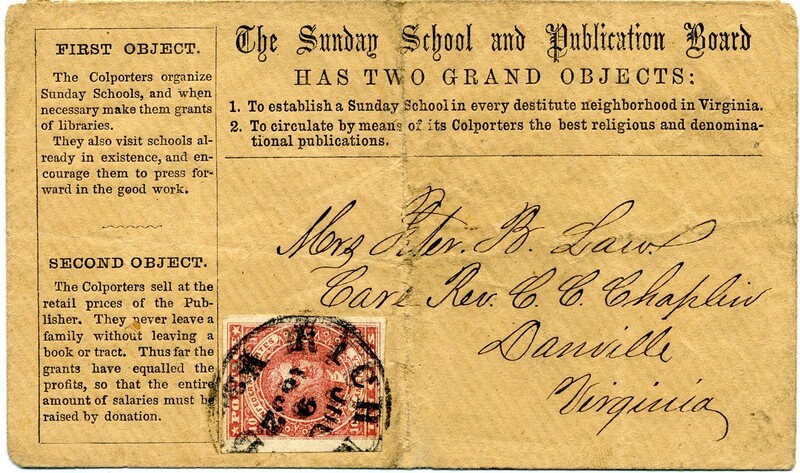 Scarce multiple use of the 10¢ rose, SCV for regular off-cover pair $1,500, CSA CV $2,000, CSA CV for cover $2,750. $1,600. 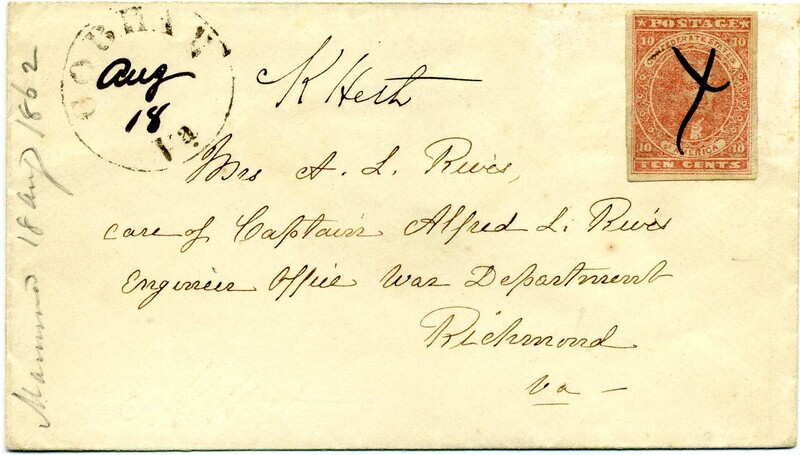 CSA 5, 10¢ rose used with manuscript "X" cancel, COBHAM / Va.// AUG / 18  cds with date in matching manuscript on commercially-made cover to "Mrs. A. L. Rives, care of Captain Alfred L. Rives, Engineer Office, War Department, Richmond Va.," fresh and Very Fine, $700. Alfred Landon Rives was one of the two Chiefs of the Corps of Engineers to General Robert E. Lee. 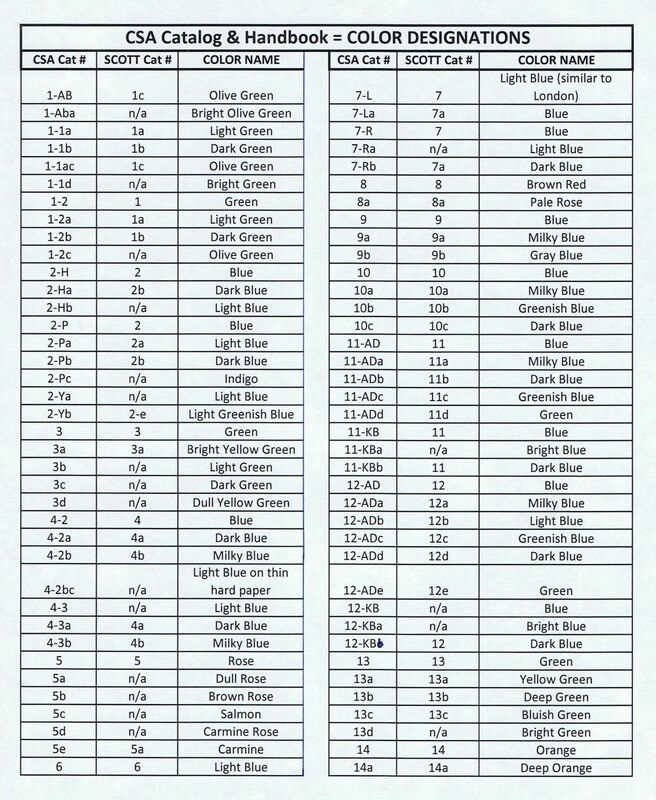 See linked page for more detailed information.